Emboldened by my success in locating the secret Adult World kalbi butcher, I was curious to discover what else might be lurking around that mysterious strip of stores. It turned out that there were no less than three large Korean groceries in close proximity, which made me very happy as one of my hobbies is going to supermarkets and buying food. There’s nothing like wandering around the fluorescent lit aisles, admiring the seafood and fondling the vegetables. One of these supermarkets has a sweet potato seller in the front, and for a couple of dollars you can walk away with a steaming paper bag of roasted sweet potatoes. I always get some when I go by, telling myself that sweet potatoes are really a sort of superfood etc. and so much healthier than cake. Of course, this logic doesn’t work when my next stop is at “Paris Baguette”, a frothy Korean daydream of a Parisian bakery. The pastel-coloured cakes, swaddled in whipped cream, are so adorable that it’s always a struggle between eating and squeezing them. At the very back of the sweet potato supermarket is a small independent stall that sells mandu, or dumplings (I don’t know why there are so many of these random stores within grocery stores that sell everything from cosmetics to odd clothing, but they exist, just in case you want to buy some false eyelashes along with a nice piece of brisket). It’s run by two friendly Korean ladies who make the mandu and steam it on the spot. I have a weakness for dumplings, particularly the Korean variety which I sometimes make at home. However, the disparity between the number of dumplings our family wants to eat, and the number that I can actually make is so depressing that this has become my go-to place to buy them. Note: if you want a steady supply of home-made dumplings, you should start your children young. My family had no such tradition and so I’m resigned to the fact that I’ll never be as speedy as my friends who were former child-labourers. The best way to eat these pre-steamed dumplings is to take them home and pan fry them until they are golden and slightly crispy. Served with a dipping sauce of vinegar and soy sauce, you’ll find that small children (who were previously engrossed in redecorating the house with Lego) will greet you with cries of delight. My report on the joys of this neighborhood would be incomplete without mentioning The Face Shop. This is an outlet of the popular Korean high street cosmetic store, and is fully stocked with every kind of potion for a beautiful complexion. Guiltily, I’m tempted to go in each time I stagger past, laden with my bags of sweet potatoes, cake, and mandu. What makes me hesitate is the life-size cardboard cutout of Kim Hyun Joong. At first, I wasn’t sure why he was advertising cosmetics. However, a closer inspection reveals flawless skin, doe-like eyes and glossy lipstick. This creates a similar sort of dilemma as the cakes. You don’t know whether you’re supposed to date him, or be him. In my case, I’m so far gone into auntie-hood that I could only gaze enviously at his airbrushed complexion. I wouldn’t mind looking like a nubile twenty-something. We even have the same hairstyle. My husband has other opinions. “NO! I don’t want you to look like a guy!” But is he really? Coyly posed behind a tree, he sends conflicting signals. I think on the whole, I’d prefer some older “uncle” type like Lee Byung Hun. Mandu – If you can’t find a convenient freshly-made source, here’s a recipe from a blog that I love. love the title. and then felt like i accompanied you on your little excursion. yep, know the sweet potato guy (yum! ), our bakery is called ‘tous les jour’ (koreans love anything that sounds french even though its impossible for them to pronounce), mandu (yes, super time-consuming and never satisfying after you realize how effortlessly they disappear), and finally the flower boys. not sure how koreans became so fanatical about skin care (who you looking at?) 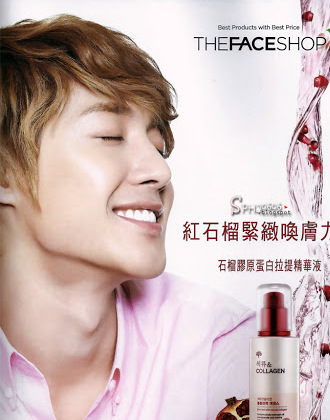 but now even the male actors market the bb creams and other skin care products. not as masculine, it’s true, but the flawless skin sure is pretty! 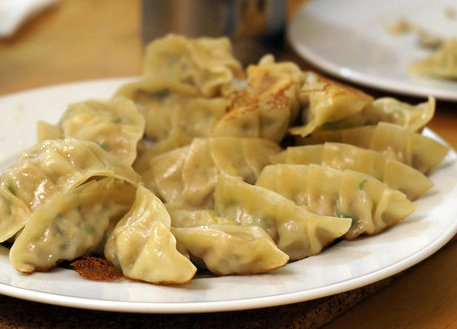 You just really made my mouth start watering for dumplings. More dumplings = more happiness! You can roast sweet potatoes in the oven — in fact, they sell this special pot at the Korean grocery store for roasting the potatoes. It has holes in it and the entire contraption goes into the oven. I’ve been very tempted to buy one, but since the sweet potato vendor is standing right outside, I really don’t have any excuse to do so! Frankly, I think he is too pretty, like your “dumpling” .Gender identity and crossing, drag, hybridization are perhaps different representations of “dumpling”. Youth is always a priceless commodity. ; only how it’s wrapped in their presetation. “older uncles” could only look at them with nostaligia, remorse and some consolation that we were once as young as them.Ah,…once! But just think, we’re not as old yet as we will be in the future!! If you really want to freak out your kids, puree some spinach and mix it into the dough to make green dumplings. I have no comments on Kim Hyun Joong. I’m so impressed that you made the dumpling skins too. I’ve never been able to roll them thin enough — which is why I’m back to buying wrappers. Actually when we visited the original Din Tai Fung in Taipei last year, they did have green dumplings (very beautiful, exquisite ones that looked nothing like mine)! Let’s go get dumplings sometime! Have a great time in NYC. Eat some great food for me! We had dinner at State Bird Provisions in SF a few weeks ago and it was just amazing! Should we try to get our next dinner on the calendar? We are generally around since tickets to FL are crazy expensive and we probably won’t be going this spring break. Sounds great! Shall we try do one w/o kids again ;)? Why is the advertisement in Chinese if it’s meant for Korean clients? How about we admire the quality of photoshop, not the person’s youth? !